(Made from a sugar medium. Wooden skewers, boards and a minimum amount of wire may be used for support. Base/presentation board or drape to fit within a 40cm square). Queensland Cake Expo half-day workshops, 2 full day workshops, and a 2-hour demo. Demo at Northshore branch of the Cake Decorators Association of WA. How to make 100% edible, super detailed modelling chocolate roses and peonies. 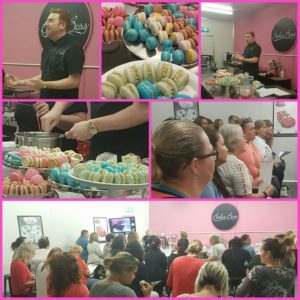 Macaron demo At the Swan Districts branch of the Cake Decorators Association of WA. Free Demo! Detailed flowers made super fast using Choc-it modelling chocolate. I’ll run through a few different ways to make large realistic roses, an update on the 2 minute rose, large peonies, banners and borders and more. Sitting Modelling Chocolate unicorn cake topper with micro modelling chocolate flowers workshop. 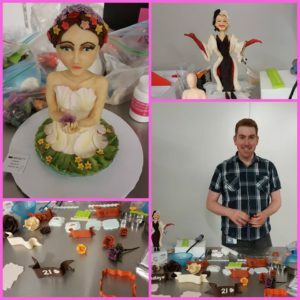 2.5 hour workshop – How to make modelling chocolate and a Sitting Modelling Chocolate unicorn cake topper with micro modelling chocolate flowers workshop. Mandurah branch of the Cake Decorators Association of WA. Stencilling basic buttercream, how to make your own piping bags fast, using modelling chocolate for fast moulded borders and banners, using modelling chocolate to make writing with clickstix and tappits, Using metallic lustre on borders and writing, dry dusting and with decorator’s alcohol, how to make ultra detailed 100% edible chocolate flowers with Rice Krispie centres, how to make fondant, flower paste and modelling chocolate from scratch – fast then finished with a quick hands-on workshop with everyone making their own super-fast basic chocolate roses. Northshore branch of the Cake Decorators Association of WA. How to make and work with modelling chocolate demo day. Also covered, borders, banners, making text with clickstix and tappits, fast flowers and detailed flowers with modelling chocolate and basic sculpting. Albany Branch of the Cake Decorators Association of WA. Season three of the Great Australian Bake Off aired. I was a contestant, I made it to episode 7 of 10. Red velvet cake, sour cream white chocolate ganache, rich vanilla cake, homemade fondant, homemade modelling chocolate, mexican paste/flower paste recipe, how to make perfect macarons. Presented a half day sculpting with modelling chocolate on an armature workshop at the biennial National seminar hosted by in 2017 by the CDAWA. Filming the Great Australian Bake Off.